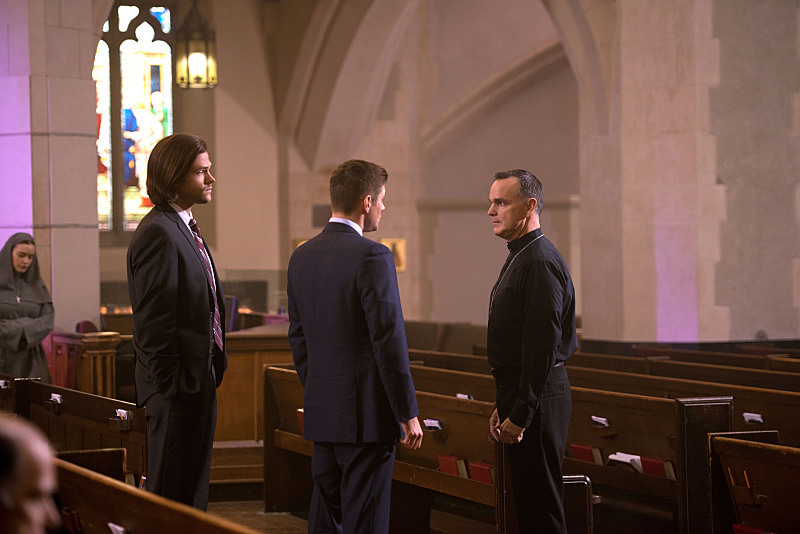 The CW has released preview images from the March 25 episode of Supernatural. The episode is called “Paint it Black” and here is how they describe it. The photos follow below. 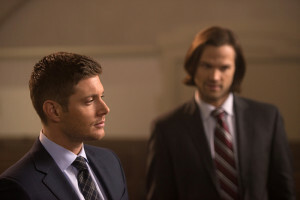 ROWENA MAKES PLANS TO RECLAIM HER MAGIC — Sam (Jared Padalecki) and Dean (Jensen Ackles) investigate a string of suicides committed by people with little in common other than the identical, grisly method of death — slow, self-administered disembowlment. All of the victims were members of a Catholic church and had recently given confession, leading the brothers to suspect the priest (guest star Stephen Daniel Curtis) is somehow involved. Meanwhile, when Crowley (Mark Sheppard) captures Olivette (guest star Teryl Rothery), the leader of the Grand Coven, Rowena (guest star Ruth Connell) pleads her case to be allowed to practice magic freely again.